Vasilis Kostas grew up in Epirus, a region in northwest Greece. The indigenous music of the area is known for its strong melodic lines, sad lyrics, and slow rhythms. Every summer, locals hold panegyria — multiday, music-filled religious festivals in which they mourn their losses and celebrate what remains. Vasilis was mentored by his grandfather and other elders in learning the old songs of Epirus. One of his early teachers was Andreas Fakos, an old clarinet master, who taught Vasilis the regional styles found throughout Epirus. Accompanying himself on guitar, Vasils performed at weddings and local celebrations. When Berklee College of Music offered him a scholarship in jazz guitar, he thought he was ready to leave his tradition behind. But then Berklee sent Vasilis to Spain to present the traditional music of Greece. He had begun to learn the Greek laouto (lute.) After performing, Vasilis met flamenco legend José Mercé, who encouraged him to continue the Greek laouto rather than the guitar, "This is your future." Traditionally, the laouto serves as an accompanying instrument and is strummed. 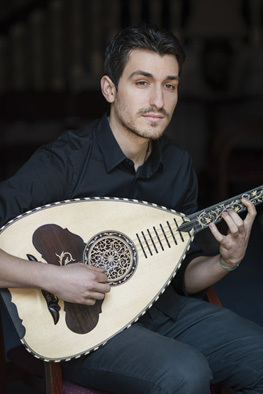 Vasilis has transformed the technique and repertoire of the laouto. He began adapting the complex melodic lines of the clarinet to the fretted laouto and went on to record and perform with living legend and master clarinetist Petroloukas Halkias. Apprentice Lysander Jaffe has a background in western classical violin. His virtuosity allows him pick up the music of Epirus and improvise in this Greek style. The apprenticeship will involve aural transmission of traditional repertoire, building a vocabulary of idiomatic ornamentation, and ensemble playing with laouto, violin, and percussion. Outside of Greece, virtually no one plays Epirus's violin style authentically. This apprenticeship hopes to change that.